Raseele Gulab Jamun recipe by Seema at PakiRecipes.com. *do not over cook, stop once sugar is completely dissolved. Mix all column 2 ingreidents in a large bowl and mix completely, roll up into 1 inch balls. Fry in medium to low heat until golden brown. Take from pan and place immediately in syrup. Serve warm or cool depending on preference. 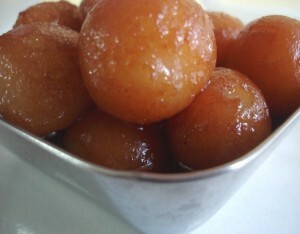 I am looking for gulab jaman recipe with khoya instead of powdered milk.